Princess Elizabeth and Prince Philip were married at 11:30 GMT on 20 November 1947 at Westminster Abbey, London. 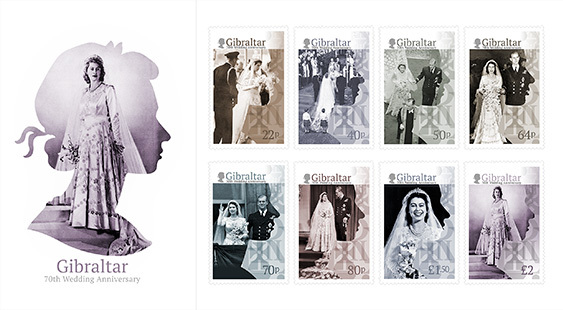 70 years laterGibraltar is honoured to issue this set of stamps depicting images from their special day. Princess Elizabeth was attended by eight bridesmaids: HRH The Princess Margaret (her younger sister), HRH Princess Alexandra ofKent (her first cousin), Lady Caroline Montagu-Douglas-Scott (daughter of the Duke of Buccleuch), Lady Mary Cambridge (her secondcousin), Lady Elizabeth Lambart (daughter of the Earl of Cavan), The Hon. Pamela Mountbatten (Philip’s first cousin), The Hon.Margaret Elphinstone (her first cousin) and The Hon. Diana Bowes-Lyon (her first cousin). Her cousins Prince William of Gloucesterand Prince Michael of Kent served as page boys. The royal parties were brought in large carriage processions, the first with The Queen and Princess Margaret and later a processionwith Queen Mary. Philip left Kensington Palace with his best man, the Marquess of Milford Haven. Princess Elizabeth arrived at theAbbey with her father, King George, in the Irish State Coach.The wedding ceremony was officiated by the Archbishop of Canterbury, Geoffrey Fisher, and the Archbishop of York, Cyril Garbett.The ceremony was recorded and broadcast by BBC Radio to 200 million people around the world. Elizabeth and Philip then proceededto Buckingham Palace, where a breakfast was held at the Ball Supper-room. The couple received over 2,500 wedding presents fromaround the world and around 10,000 telegrams of congratulations. Upon their marriage, Elizabeth took the title of her husband and became Princess Elizabeth, Duchess of Edinburgh. They departed fortheir honeymoon at Broadlands in Hampshire, home of Philip’s uncle, Earl Mountbatten.